Puerto Maldonado is a city in southeastern Peru, capital of the Madre de Dios Region founded originally for the collection of wild rubber. It is in the Amazon forest, 55 km west of the Bolivian border, on the confluence of the Tambopata and Madre de Dios River, a tributary of the Amazon River. The chief industries in Puerto Maldonado are: logging, gold dredging, brazil nut collecting, boat building and eco-tourism. A ferry crosses the river, linking the main road from Cuzco to the Peruvian towns of San Lorenzo, Iberia and Iñapari. 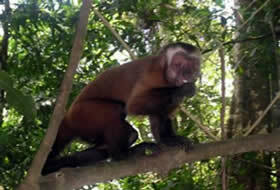 Nearby are the Manu and Tambopata-Candamo national parks and Bahuaja-Sonene national reserved area. These are some of the most pristine primary rain forests in the world. 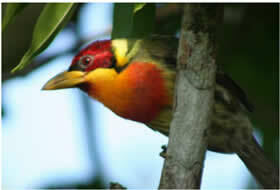 There are several tourist eco-lodges within the reserves which are accessed by boat from Puerto Maldonado. 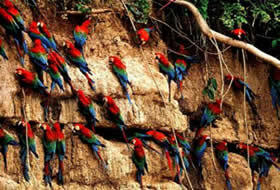 One of the main attractions are the hundreds of macaws which congregate at various "colpas", or "collpas", a Quechua word which means salted earth, (clay licks) daily to eat clay. 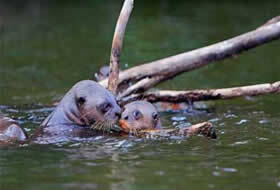 You can enjoy an exclusivecruise on amazon river tour. The area is virtually logged out; only one mill remains. Rubber collection is long gone. Recent legislation in the European Union has put hundreds of Brazil nut collectors out of work together with the associated local factory. Small amounts of gold are collected from the river, mostly by small teams of men with hand tools. Eco tourism and building the boats to transport them are the major sources of income now. There is a range of inexpensive hotels catering for backpackers and tourists. The climate is hot and humid at all times, the wet season runs from October to April when road travel often becomes impossible. Puerto Maldonado is served by the Padre Aldamiz International Airport which is used to transport eco-tourists. We offer two beautiful eco lodges in the Amazon jungle, a nice camp site and a Research Center , the first one; Wasai Maldonado Lodge, is located in the tropical city of Puerto Maldonado at the bank of the Madre de Dios river . The others , Wasai Tambopata Lodge and research centre, and our camp site are located in the Tambopata Candamo National Park, very close to the largest Macaw Clay Licks knows on the World. Our jungle Lodge and Research Centre, strategically located on the Tambopata River , offers an intimate and comfortable rainforest tourism experience close to a variety of attractions such as oxbow lakes, waterfalls, "collpas" and local communities. Its proximity to the National Park and Tambopata National Reserve guarantees the opportunity to observe well protected wild fauna with little environment impact and make some research expeditions. 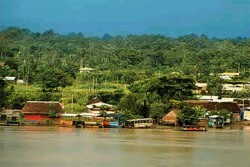 Lake Sandoval is a lake in Peru, close to the city of Puerto Maldonado, part of the Madre de Dios in the Amazon Basin. Heath River Classic 5 days and 4 nights Heath River, macaw clay lick, Sandoval lake. 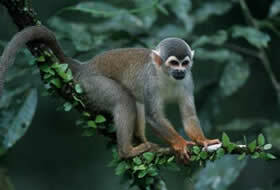 The Corto Maltes Amazonia Lodge has 27 comfortable bungalows built in wood and beautifully finished. For your convenience, we offer 2 rooms with king size bed, and 25 double or triple. Each bungalow has a private bathroom with hot water 24 hours and a large terrace with hammocks where you can enjoy the excellent view of Madre de Dios river and the jungle that surrounds us. The privacy is guaranteed to be every bungalow sufficiently separated from the others. If you carry valuables, each bungalow has its own safe for its tranquility. The lodge facilities are supplemented with: 40 m square terrace overlooking the river. Maloka for ayahuasca ceremonies (in the middle of the forest) with capacity for 70 people. Corto Maltes Classic 4 days and 3 nights Monkey Island, Tambopata - Candamo National Reserve, Sandoval Lake, Local Natives Community "Palma Real"
Inkaterra Reserva Amazonica is a gracious all-inclusive rainforest lodge, adjacent to the lush Tambopata National Reserve. A welcoming haven situated at the heart of a 12,000 Ha. (29,652-acre) private ecological reserve, the lodge offers a range of land and river excursions that introduce guests to the magic of the rainforest. This simple yet gracious, limited-electricity lodge has been an ecotourism pioneer for more than 30 years, promoting innovative sustainable use of the Southern Peruvian Rainforest, and supporting important scientific investigations since opening in 1975. Nature is our passion, people our commitment. At Rainforest Expeditions we build sanctuaries that host unique experiences, engage local communities, and help hosts and guests learn to value their relation with the Earth. Our guides are biologists, tourism professionals, or community members. All are trained in-house with a four month process that includes one month of field classes and a three month internship. Unless noted otherwise, our guides speak English. We assign guides at 10:1 ratio in Posada Amazonas and Refugio Amazonas, and at a 6:1 ratio at Tambopata Research Center. This means groups smaller than 10 people (or 6 people in TRC) will be merged with other groups under one guide. If you would like a private guide, a specialist guide or a guide in a language other than English please let us know.